Choose Your Adventure #3: Corn Maze! There is just a one-size-fits-all course for beginners through advanced runners. We’ll have a mass start and one map exchange. 12 checkpoints will be marked on the first map. Once you visit all 12 checkpoints (in any order you want) and return to the start, you’ll be given a second map with 12 more checkpoints (which you can also visit in any order you want). The total time limit is 80 minutes! There’s a time limit of 80 minutes, and for every minute late, there’s a 1 point penalty. Note for the map exchange: If you skipped any checkpoints from the first map, you cannot go back and get them once you take your second map. (This rule is to prevent an unfair advantage by collecting both sets of checkpoints during one loop). DO NOT TAKE SHORTCUTS THROUGH CORN! This rule applies to all maze visitors, not just orienteers. Anyone caught taking a shortcut will be disqualified. We want to be able to have events here in the future! All paths through the maze are about two meters wide. 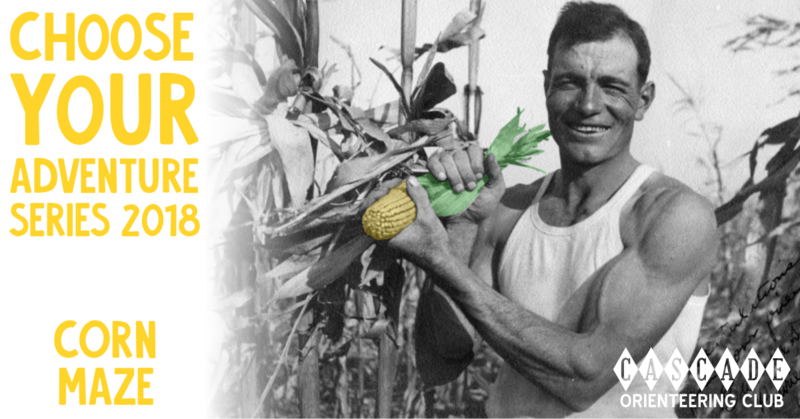 You should be able to complete the entire course without touching a single stalk of corn! Do not be tempted to take any “illegal” shortcuts, should you come across any. The uncut corn is mapped as “area with forbidden access” (ISSOM 527.1 Olive Green). In the giant tent at the maze entrance, there is one “start” path and one “finish” path. Everyone will start into the start path (ie: no entering the maze backwards). The paths within the maze have more rounded corners in reality than they do on the map. Bring a compass, especially if it’s cloudy. Bearings won’t do much for you, but man, it’s easy to get disoriented in there! Also, bring a pen/pencil/marker/highlighter. You’ll thank me later. 09:15am – MASS START for EVERYONE! NEW FOR 2018: There will be a mass start at 9:15am this year for everyone! (In previous years, to prevent a log jam of orienteers at the single entrance to the maze, we utilized “wave” starts, where we started 5 people per minute until everyone had started). Due to crop rotation, Bob moved his corn maze 340 meters east of where it’s been for the last several years, but we’re going to keep registration and check-in near where we’ve always had it. We’re going to start the race near registration, meaning that you’ll have a 340 meter run/walk along a dirt path to the maze entrance. This should be enough time to spread everyone out before you get to the maze, and it’ll also make the start process a lot simpler than before. 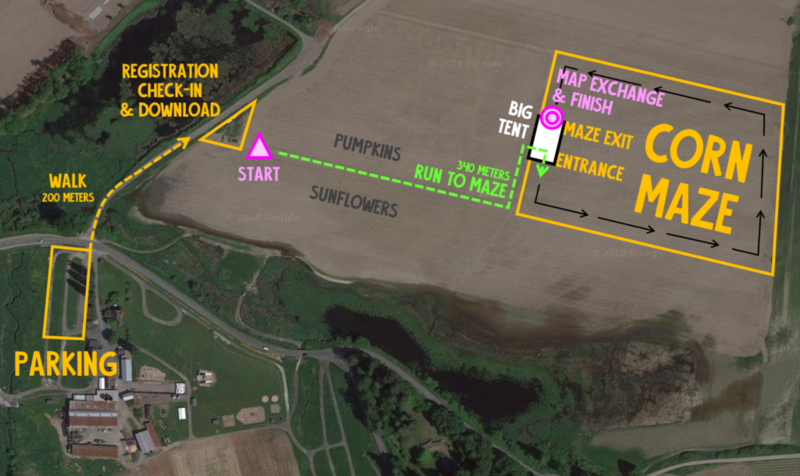 The map exchange and finish will be in the big tent at the maze, like always. Because we’re adding extra distance to the race, we’ll also add a little extra time: the time limit is 80 minutes this year, up from 75. Take the Fales Road exit from WA-522. Turn north on Fales Road and continue 2 miles to Elliott Road. Turn left (west) on Elliott Road and continue to the farm entrance (~1000 feet). Park south of Elliott Road, where the farmhouse and country store are. From there, it is about a 200m walk, across the road, to the start and finish tent. There are toilets at the farm (near parking), at the start, and near the entrance to the maze. The corn maze changes every year, and we have a 1:1000 scale of it, mapped to orienteering specifications. 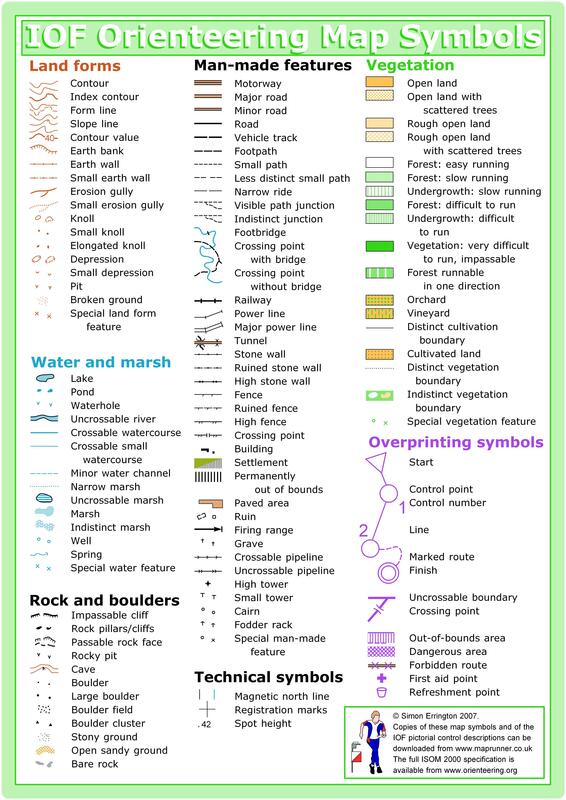 Most of the map is corn (out-of-bounds olive green), with a maze of paths throughout. There are a few other features, like firepits and a bridge/underpass.